Between 1985 and 1989 the average price of a house in the GTA increased by 113% in real terms or by $240,992 in today's dollars. Low unemployment of the late 1980s and large inflow of immigrants to the area helped to inflate the bubble. Some critics pointed to the fact that in the early 80s many women were still just entering the workforce and thus doubled the income of households by the mid 80s which further fueled the bubble. However, one could argue that bubbled was fueled mostly by massive speculative investment. In late 80s everyone thought that the housing prices are going to rise indefinitely and that turned real estate into a compelling investment for everyday Joe. More people jumped into the market hoping to make a fortune causing an artificial increase in demand. Suddenly housing became scarce, which further increased the price. Developers decided to profit on this illusive scarcity by building condos left and right - many of them in downtown Toronto. During the peak of the bubble the borrowing cost started increasing and the 5 year fixed mortgage reached 12.7%. Coupled with the early 90s recession, a spike in unemployment and a drop in the inflow of immigrants to the area, housing prices in the GTA collapsed. 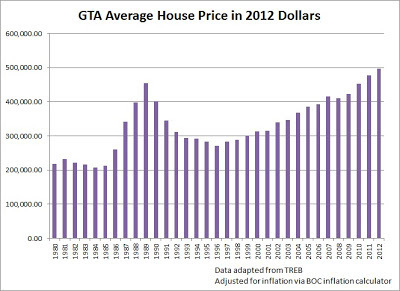 Between 1989 and 1996 average price of a house in GTA have declined by 40% adjusted for inflation or $182,625 in today's money. Downtown of Toronto was hit the worst with over 50% decline in value of a home. Unaccounted for inflation, it took 13 years for the average house price to recover in the GTA. In nominal terms, the average price breached the 1989 peak of $273,698 in 2002. However, viewing prices in nominal terms has an upward bias. For example, take a look at the GTA average house prices between 1980 and 1985 in the first graph below. As you can see there is a clear upward trend of price increases. Yet if you look at the second graph below, which is adjusted for inflation, you can see that between 1980 and 1985 housing prices were in fact declining. Once adjusted for inflation you can see the real scope of the Toronto housing bubble of 1980s. Only in 2010, or 21 years later, real average housing prices reached the peak of 1989. In real terms, the fallout from the burst of the bubble looks much worse than when you look at nominal numbers. In nominal terms the average house prices between 1989 and 1996 fell by 23%, while in real terms it fell by whopping 40%. At the bottom of the last housing crash the prices still settled by near 30% above what they were in the beginning of the 80s. Some attribute it to increased population, women joining the workforce in bigger numbers and income growth. Most likely all those factors played a role as well as debt growth. 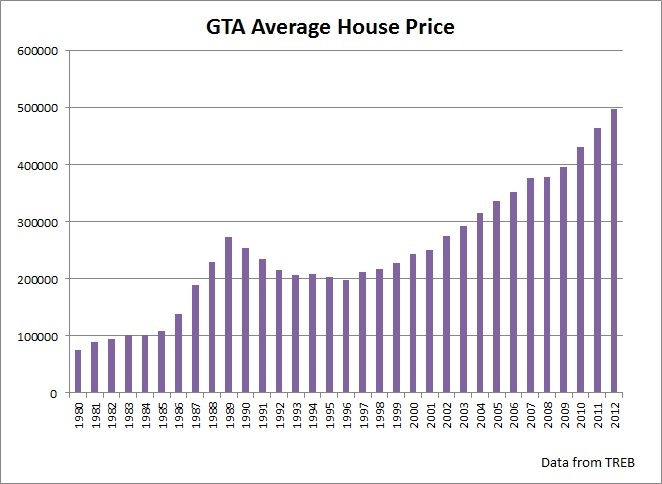 Between 1985 and 1996 the real annual price growth of house in GTA was 2.5% which is slightly above Canada's average GDP growth of 2.2% in the same period. Since the financial crisis condo prices were rising above 6% a year while economy grew around 2%. 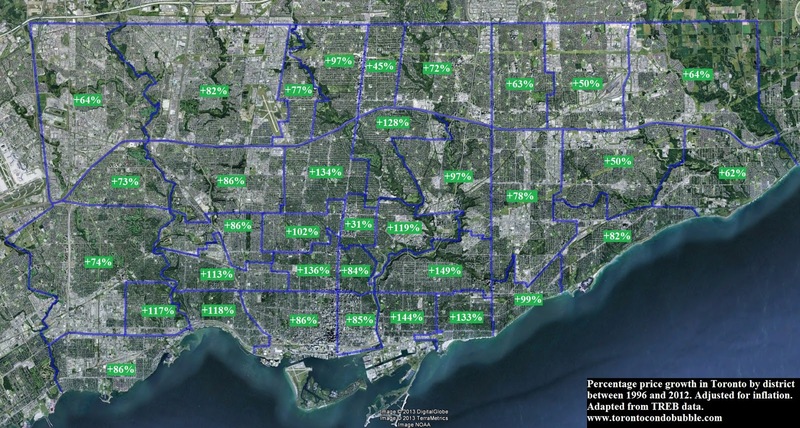 Currently the average house price in the GTA is 9% above the peak achieved in 1989. But real estate is local and there is huge differences between neighborhoods. 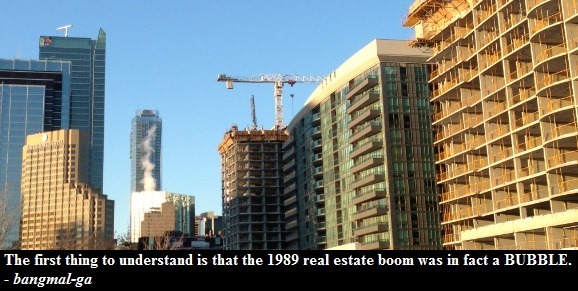 If you bought a condo in downtown Toronto in 1989 and you were to sold it today, you would likely still end up selling your house at a lose and that's not counting the closing costs of a sale. Below is a chart which shows the inflation adjusted percentage change of house value from 1989 peak to 2012. Almost one third of Toronto - including downtown - is still below the peak of 1989. The areas of Toronto that crashed the most during last housing bubble are still below the last peak, while some other are 50% above it. The chart below shows the percentage growth of Toronto's average home price between 1996 and 2012 adjusted for inflation. The areas just east of downtown have recorded the largest growth. I wonder whether East York will see the biggest declines in prices this time the bubble bursts. How do you interpret the charts above? What are the similarities and the differences between the Toronto housing bubble of 1980s and now? I will answer those questions in a later post, but before then help me by commenting below of what you think of the charts above. How would you interpret them? What areas do you think will crash the most and least?